The core of AHB’s business is deep hole drilling. Deep hole drilling is the common name for processes that produce holes deeper than five times diameter. These processes include gundrilling, solid boring, trepanning, pull boring and many others. 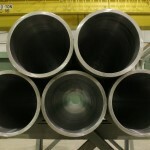 Deep hole drilling may be ordered in hole sizes from ½” to 24” inside diameter. Ask about our blind bores and complex internal machining capabilities for your critical bores!